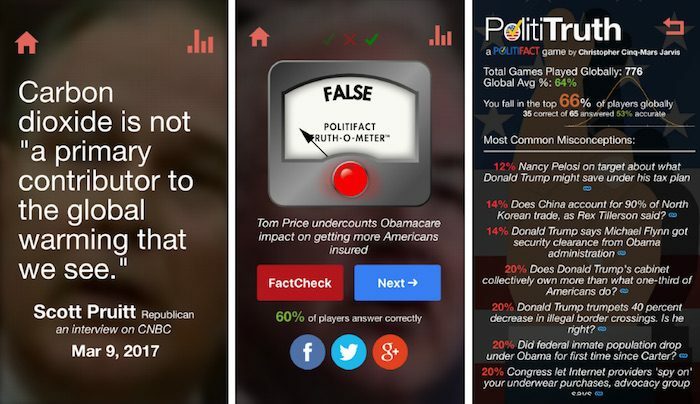 Aug. 3, 2017, 11 a.m.
By Christine Schmidt @newsbyschmidt Aug. 3, 2017, 11 a.m.
After the election, Jarvis was inspired to team up with PolitiFact to create the mobile game PolitiTruth. 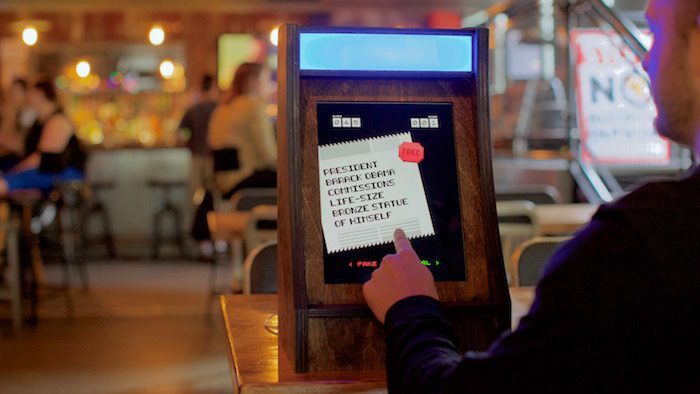 The Washington, D.C.-based digital creative agency ISL built Fake News: The Game and has introduced it as an app and a traveling arcade game in some bars. And Maggie Farley, a JoLT Fellow at American University and former L.A. Times correspondent, developed the concept of a fake news game with AU Game Lab director Lindsay Grace even before the election, though the lab recently released the 2.0 version of Factitious, a browser-based game heavy with context for its articles. The games share roughly the same setup of presenting a player with a headline, article, or claim and asking them to guess its truthfulness. None of the items are made up — they’re all published online somewhere, either a website known for promoting fake news or an actual news organization’s site. Fake News: The Game only shows a headline, and Factitious includes a snippet of an article with a headline and a source if you choose to see it. 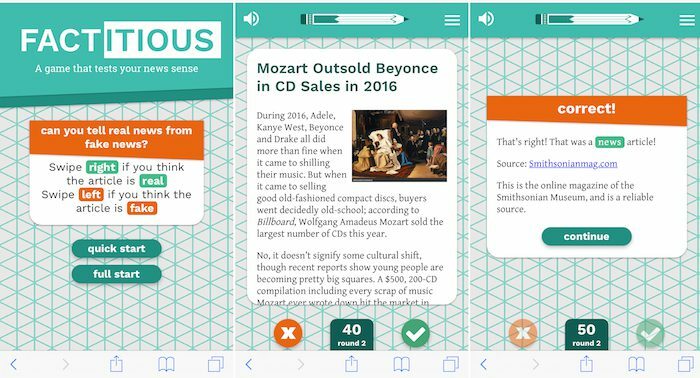 (Factitious is an open source project developed with a Knight Foundation grant for gaming in journalism. Knight also supports Nieman Lab.) PolitiTruth draws from PolitiFact’s bounty of factchecked claims to give you a quote, the name of the public figure who said it, and the context of when/where they said it, and asks you to guess the veracity of the claim made in the quote. You get points for correctness and in some games that translates to a global leaderboard. Are they as addictive as Pokemon Go or Candy Crush? That’s the hope. “The global pandemic of misinformation is obviously unavoidable and real, and if we can play a small, small role in pushing back against that, then we’re excited and thrilled to help fight the good fight,” said D.J. Saul, ISL’s chief marketing officer and managing director. Swiping left or right to make a decision in the style of date-matching apps Tinder and Bumble helps, too. Sometimes it takes multiple tries to get the right game design. AU’s Factitious started before the election as a game show-style game. But it quickly became clear that it was too hard for non-newsy people to navigate, Grace said. “The first version of this game didn’t really apply what we know about people’s attention span, what makes an interface fun, and how to design a quick mobile experience. 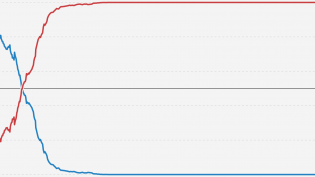 The second version takes all of this into account.” The change paid off: the first game only had a couple hundred plays, but Grace said Factitious has been played millions of times in the few months that it has been live. ISL’s Saul said that the data from Fake News: The Game has showed that people getting more accurate the more they play. Their players have a 65 percent average in identifying real or fake headlines correctly. He noted that the snippets in the game are actually informing some users: “People don’t have to feel as though they have to read the entire article, but they also can. 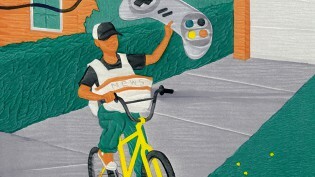 If something seems dubious, they can be directed straight to that journalism. They can even see how commenters and people have responded to that particular journalistic inquiry,” he said. The developers are learning, too — from the players’ data. “We keep detailed statistics that we hope to be able to break down by demographic… [to] surgically target where this fake news is being proliferated from and who’s most vulnerable to it,” Jarvis said. These games are not the end. ISL is considering selling kits so people can set up the arcade-style version of Fake News: the Game themselves, but players can also use the game through Amazon’s Alexa tool in an extension ISL built out. Saul explained that a preloaded soundbite from Donald Trump plays to tell users if they’re correct or not. On the other hand, PolitiFact is excited to have PolitiTruth as another tool in its outreach arsenal. Sharockman added that this fall, PolitiFact will be launching different experiments to combat the spread of fake news with the support of the Knight Foundation. This game is one of those experiments, and Sharockman also hopes to bring the game into classrooms as a news literacy tool. Image of the Fake News: The Game’s arcade game setup courtesy of ISL. POSTED Aug. 3, 2017, 11 a.m.
Schmidt, Christine. "Games might be a good tool for fighting fake news. Here’s what three developers have learned." Nieman Journalism Lab. Nieman Foundation for Journalism at Harvard, 3 Aug. 2017. Web. 25 Apr. 2019. Schmidt, Christine. 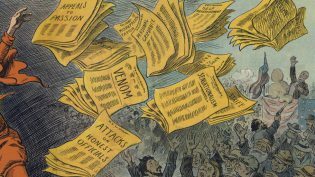 "Games might be a good tool for fighting fake news. Here’s what three developers have learned." Nieman Journalism Lab. Last modified August 3, 2017. Accessed April 25, 2019. https://www.niemanlab.org/2017/08/games-might-be-a-good-tool-for-fighting-fake-news-heres-what-three-developers-have-learned/.